'Women in Mind' is a series of events by the Women and Mental Health Special Interest Group, Royal College of Psychiatrists, in collaboration with the Institute of Psychiatry, Psychology & Neuroscience, King’s College London. It aims to engage health professionals and the public in debate and discussion about challenges to women's mental health across the lifecycle. The events are shaped around interviews with inspirational women on professional or personal experiences that have shaped their views on women's mental health, both in terms of difficulties and resilience. 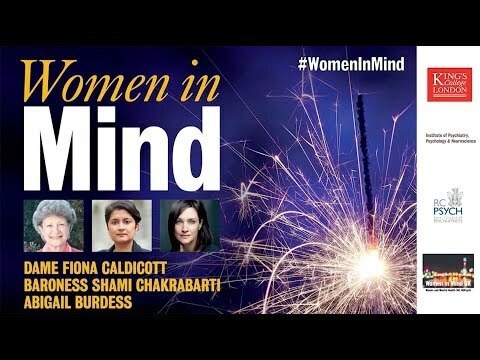 Women in Mind event held on 27th November 2017 with Dame Fiona Caldecott, Baroness Shami Chakrabarti and Abigail Burdess. Panel chaired by then WMHSIG chair, Nicola Byrne.